Perry County. Rush Creek intersects Junction City and New Lexington. Somerset Creek, one of the tributaries to Rush Creek, flows through the town of Somerset. Most of the land in the watershed area is either wooded or used for agriculture. Acid mine drainage, sedimentation, erosion, agriculture, sewage. Acid mine drainage (AMD) is the primary pollutant to Rush Creek. There are approximately 3,899 acres of surface mines and 1,965 acres of underground mines in the watershed. Other sources of pollution to this stream include sedimentation, erosion, agriculture, sewage, and nutrients. There is no watershed group for the Rush Creek Watershed. Reclamation efforts are managed by the Ohio Department of Natural Resources (ODNR), which has been responsible for planning and executing all reclamation projects. The Office of Surface Mining oversees these projects. The Rehoboth Creek subwatershed is the site of an enormous gob pile that was left behind when mining ceased in the area around 1965. In the 1970s, a small project aiming to control sediment from the gob pile was unsuccessful. 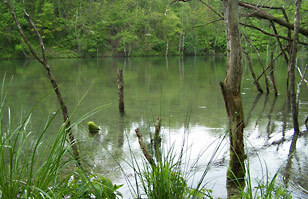 The Ohio Department of Natural Resources (ODNR) started a project to reclaim the site in 1997. The three-phase plan would restore approximately 450 acres of mined land by controlling flooding in the area, controlling sediment loading, and controlling AMD. The third phase of the reclamation project was completed in 2002. All projects are funded primarily by federal funds through the U.S. Department of the Interior’s Office of Surface Mining (OSM). A small portion of project funds have come from the Ohio Department of Natural Resources’ (ODNR) Abandoned Mine Land (AML) Reclamation Program. There have been six projects completed to date, four of which have been focused on the reclamation of the Rehoboth Mine site. There are two projects planned to continue reclamation of the Rehoboth Mine site in the next five years.